Ophidian 2360: Survival of the Fittest – Energy and Damage, the Cornerstones of a Balanced Breakfast! Welcome to today’s installment of the preview of our Kickstarter campaign for Ophidian 2360: Survival of the Fittest! Today let’s start with currency! In the Ophidian 2350 game, the currency in the game is Credit Points. These are used to “Play” cards (bring the cards from your hand onto the table) and “Maintain” cards (keep those cards in play between Waves) Some cards did not have a Maintain cost, and some cards had a “skull and crossbones” icon which indicated that they could not be maintained. Playing Cards: To play a card from hand a player must have a Gladiator with the matching Discipline and Level (or higher) as well as enough CP to pay the card’s play cost. P = play cost, M = cost to “Maintain” the card into the next Wave. In Ophidian moving forward, the middle man has been cut out. Credit Points may have been used to buy the energy needed to supply and maintain Gladiator’s allies and effects… but moving forward, all costs will be paid with Energy. Players will receive the same ‘budget’ before each Wave, and when mixing Ophidian 2350 and 2360 cards, CP and Energy are synonymous. If a card cannot be Maintained, it won’t have a Maintain Cost. 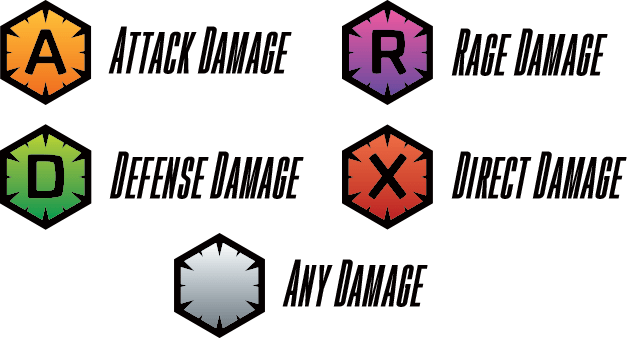 Because one preview isn’t enough, let’s also talk about Damage! 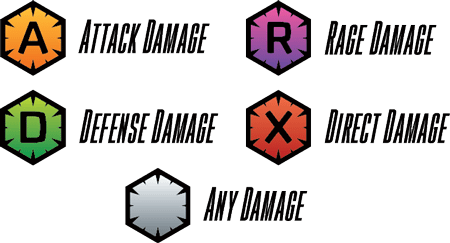 In the game, there are 4 main types of Damage, as well as a unversal-catch-all DMG. ADMG is Attack Damage, DDMG is Defense Damage, RDMG is Rage Damage, and XDMG is Direct Damage. ADMG value is how much damage is done. DDMG is defense damage, which is only dealt while the card that can inflict DDMG is being attacked. XDMG is Direct Damage, which cannot be Protected or Intercepted. … If a Character attacks an Unset Raging Gladiator that Character takes 1 RDMG (Rage Damage, always a default of 1). Check back with us tomorrow for more icons to be revealed! *Note that card images are not final.